We begin this blog with perhaps the most famous cartoon by the most famous cartoonist of the Great War. Bruce Bairnsfather’s ‘Better ‘Ole,’ was published in The Bystander magazine’s Christmas number on 24 November 1915 and was an instant hit with its readers both at home and at the front, summing up, as it did, that most elemental of human conditions - discontent. 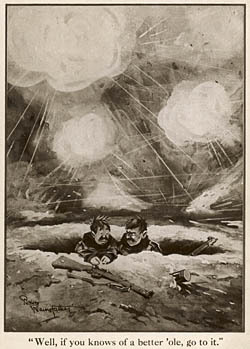 Under the title, ‘One of our minor wars – "Well, if you knows of a better ‘ole, go to it"’, the scenario of two hapless Tommies, marooned in a shell-hole in No-Man’s Land during a heavy bombardment and bickering over their predicament conjured humour out of the blackest of situations and epitomised both the dry wit of the typical British Tommy with his world-weary wisecracks, not to mention his admirable stoicism. Bairnsfather’s cartoons are a well-loved and integral part of Great War popular culture; and are likewise an integral part of our WW1 collections here, housing, as we do, the complete run of The Bystander which is part of the Illustrated London News archive. ‘The Better Ole’ may be familiar to anyone with a passing interest in the First World War but we’ll be featuring lots more about Bairnsfather in this blog over the coming months, including, we hope, some more unexpected and little-seen images of his life, work and legacy. Click here to see some other examples of Bairnsfather's work.